Democratic Rep. Carolyn McCarthy of New York plans to introduce legislation in the coming days that would limit access to the type of weaponry used to gun down Arizona Rep. Gabrielle Giffords (D) and 19 other people. Giffords remains in critical condition after 22-year-old alleged gunman Jared Loughner open fired at a town hall-style meeting at a Tuscon grocery store on Saturday. Twenty people were shot and six were killed. The shocking incident prompted the House of Representatives to call off this week's planned business and has spurred some lawmakers to propose some new laws related to the shooting, including McCarthy's proposals. McCarthy today will officially announce she is working on a bill targeting the high-capacity ammunition clips the gunman allegedly used in the shooting, as Politico first reported. "My staff is working on looking at the different legislation fixes that we might be able to do and we might be able to introduce as early as tomorrow," she told Politico. The congresswoman plans to discuss the legislation this week with Speaker John Boehner and Minority Leader Nancy Pelosi, her staff confirms to CBSNews.com. "We need to look at how this is going to work, to protect people, certainly citizens, and we have to look at what I can pass," McCarthy said. "I don't want to give the NRA - excuse the pun - the ammunition to come at me either." 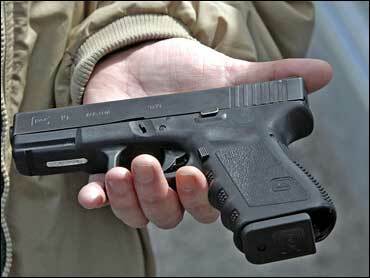 The Glock 19 9mm semi-automatic pistol the alleged shooter used was purchased legally. The gun's high capacity magazine would have been illegal under the assault weapons ban, which Congress allowed to expire in 2004. Arizona's gun laws are some of the most lax in the nation, the Washington Post reports. Any law-abiding resident older than 18 can purchase a firearm, and Loughner passed the federally-required instant background check. Meanwhile, Democratic Rep. Robert Brady of Pennsylvania plans to introduce a bill to make it a federal crime to use language or symbols that could be perceived as threatening or inciting violence against a member of Congress or federal official, CNN reports. "The president is a federal official," Brady said. "You can't do it to him; you should not be able to do it to a congressman, senator or federal judge." Saturday's shooting has led to a national debate over whether the current climate of partisan rancor led to the shooting. "This is not a wake up call, this is major alarms going off," Brady said. He took specific issue with some of the rhetoric used by former Alaska Gov. Sarah Palin. "You can't put bulls eyes or crosshairs on a United States congressman or a federal official," he said. "I understand this web site that had it on there is no longer in existence. Someone is feeling a little guilty." A staffer for Palin over the weekend insisted there was nothing wrong with the crosshairs imagery Palin used during the 2010 elections and that the ex-governor had nothing to do with the tragedy. Rep. Gabrielle Giffords "Holding Her Own"